If you need a little something to enhance your observation experience with a microscope, then the microscope accessories site is for you. Our range of products include glass slide and microscopes parts, and if you need something that is not listed here, please contact us and we will try to source it for you. Capture every moment through your scope with the saxon ScopePix Smartphone Adapter﻿! Suitable for use with telescopes, binoculars, spotting scopes, and microscopes. Compatible with all smartphone models. Use your smartphone to capture images and videos of all your amazing discoveries with the saxon ScopePix Smartphone Adapter﻿. Fits telescopes. binoculars, spotting scopes, and microscopes. The possibilities are endless with the saxon 50pcs Pre-Cleaned Blank Slides Kit! You too can immerse yourself in the world of biology! Discover the wonders of biology around you. 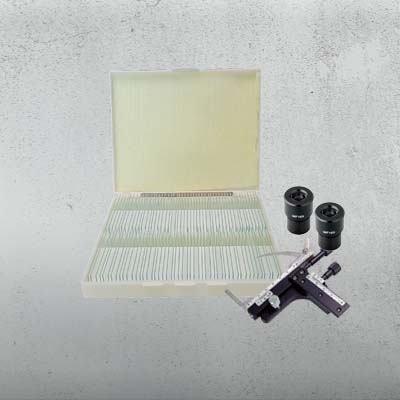 Simply gather, prepare, and observe your specimen with the saxon 50pcs Pre-Cleaned Blank Slides Kit. The possibilities are endless with the saxon 100pcs Pre-Cleaned Blank Slides Kit! You too can immerse yourself in the world of biology! Discover the wonders of biology around you. Simply gather, prepare, and observe your specimen with the saxon 100pcs Pre-Cleaned Blank Slides Kit. Perfect for anyone looking for an introduction to plant biology! The saxon Plant Biological Microscope Prepared Slides (50pcs) contains 50 slides of prepared animal slides, each of which has been meticulously prepared. Perfect for anyone looking for an introduction to animal biology! The saxon Animals Biological Microscope Prepared Slides (50pcs) contains 50 slides of prepared animal slides, each of which has been meticulously prepared. The ultimate introduction to biology! Consisting of 50 prepared plant slides and 50 prepared animal slides, the saxon Biological Microscope Slides is a must have for any student of biology. Always have a vast array of plant and animals specimens ready, whether for study or casual viewing. The saxon Ores Sample is perfect as an introduction to geology. Familiarise yourself with the properties and characteristics of different rocks and stones. For an even closer look at these samples, observe them under a saxon stereo microscope. Perfect for use in schools and at home as a reference tool or for study. Make sure your best samples are never misplaced with the saxon Microscope Slides Case for 50pcs! Capable of holding up to 50 slides, the saxon Microscope Slides Case for 50pcs ﻿is indispensable for any serious microscope user. Make sure your best samples are never misplaced with the saxon Microscope Slides Case for 100pcs! Capable of holding up to 100 slides, the saxon Microscope Slides Case for 100pcs ﻿is indispensable for any serious microscope user.